“How do I find the right Weight Loss Program or Diet Book?” That is the number one question I hear from women, so I want to dive into that subject and give you some guidance. I know that it can be very confusing when you have the option of so many books, online programs and services available to you. There is a lot of trial and error involved, but you can find a unique plan that works. The trick is that you may have to create a hybrid plan on your own. One of the problems with finding a weight loss program that works is that most of them are put together by people that seem to don’t live in the real world. They are assembled by people with an “idea” or a “belief” about weight loss that may not work for you. Sadly, many of the weight loss products and programs are also put together by people who just want to make money off your desire to get healthy. Here are some hints from real life that will help you know what to look for in a weight loss program so you can find one that will work for you. You need calories to live and function. You also need calories to lose weight. The idea that by cutting out a ton of calories the weight will fall off doesn’t work even thought that would seem to make sense. Especially if you are also combining a fitness plan with your diet – eating enough calories is essential. The metabolic process the body uses to burn fat after exercise is dependent on additional calories coming in to provide fuel for that process. The body needs to be assured that it has everything it needs to survive and will turn its attention to consuming stored fat as it moves into the repair and growth process of the cycle. That is how taking in enough calories works to create weight loss. If someone tells you to drop your calories too low, they are going to push you into ketosis or starvation mode and the body will eat your muscle fibers for fuel and you can even gain weight. We all have jobs, responsibilities and families, so the plan you choose has to fit our lifestyle or it just isn’t going to work. Don’t take on anything you can’t do. Lifestyle changes have to be built over time. You may have some long term lifestyle goals you want to reach, but that are not practical now. Take some time to really evaluate your commitments and challenge yourself to change in areas where you know you can. For example, you may have to move your schedule around to find time to work out. Also, you may have to re-evaluate the foods you’re buying and make smarter choices financially and in terms of health value. So, some random woman is plastered all over a website saying how she lost 90lbs in 30 days? Guess what? If that isn’t an out and out lie then there is something you are not being told, like how she gained back 130lbs in the 40 days after. Most expert sources say that the healthy (average) weight loss rate is about a pound a week. That reflects that your diet and life style have changed as well so you know that the weight will not come back. Also, when you first start a diet or exercise routine you will lose more weight in the first few weeks before plateauing at the pound or two a week. That is just how real life and your body work. There are exceptions to the rule, but the point is that you should not beat yourself up if your weight loss is slow. Everyone loses weight at a different rate, some quickly and some slowly. If you are losing weight based on diet alone and with no exercise then what you are doing is engaging in muscle wasting where you are starving your body and it is eating your muscles to survive. Or, you are losing it through losing water weight which means you are well on your way to a case of serious dehydration. Healthy weight loss comes from the metabolism speeding up to burn calories through exertion, and then the weight loss happens through the process of repair and growth of muscle. 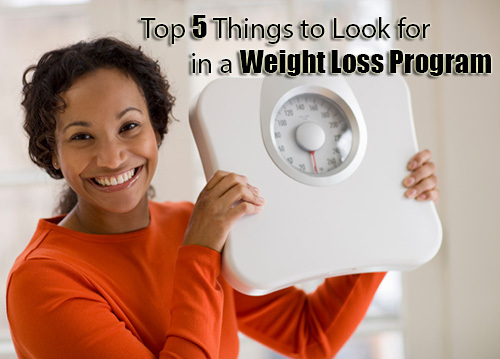 Real Life Hint #5 – Look for a plan that promotes realistic weight loss, not quick weight loss. Look for a plan that talks about real life, real expectations and real weight loss time frames. If it sounds too good to be true it is. As soon as you read the words “breakthrough” or see an email with the subject line “what doctor’s don’t want you to know! !” run away. Obesity is the single largest contributor to many chronic conditions and if there was a real breakthrough in how to lose weight fast and easy, it would be sung from the mountain tops. Don’t live in fantasy land, live in the real world and get real life results with your weight loss.